Toy Chest Theater: Spider-Man Fails? This image makes me think of the art we saw in the aftermath of 9/11. Images of the superheroes we love, placed next to the very real heroes who rushed in to save lives and provide aid when the terrorist attacks occurred. 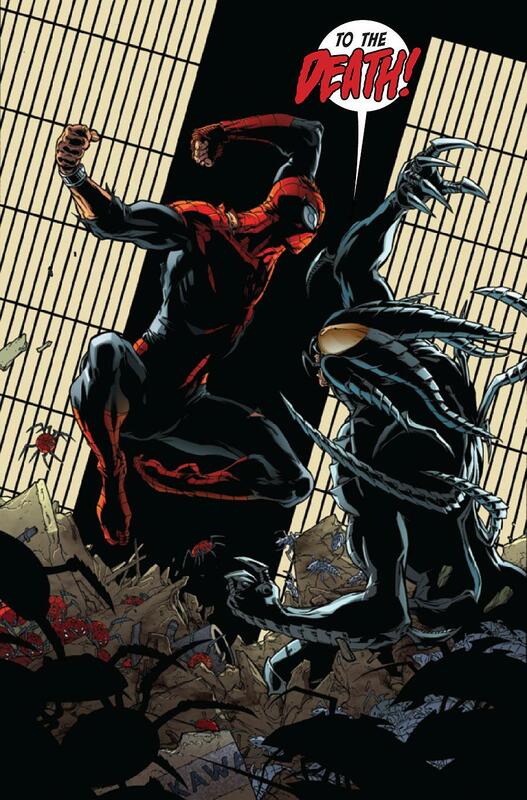 John Romita Jr’s work in The Amazing Spider-Man #36 comes to mind, for obvious reasons. The caption on photographer Joe Hume’s Instagram page reads “Sometimes we fail.” That’s interesting, as that’s not how I read this image. Mourning? Yes. Failure? No. But that seems to be the story Hume had in mind. Fair enough, I suppose. Either way, it’s a powerful image. The iconography of the Spider-Man suit and the fireman’s hat. The orange blaze in the background. But the lighting from below is what clinches it. I don’t know that it’s supposed to be from the fire. A street light, perhaps. Or a light on one of the buildings. But it works very well. 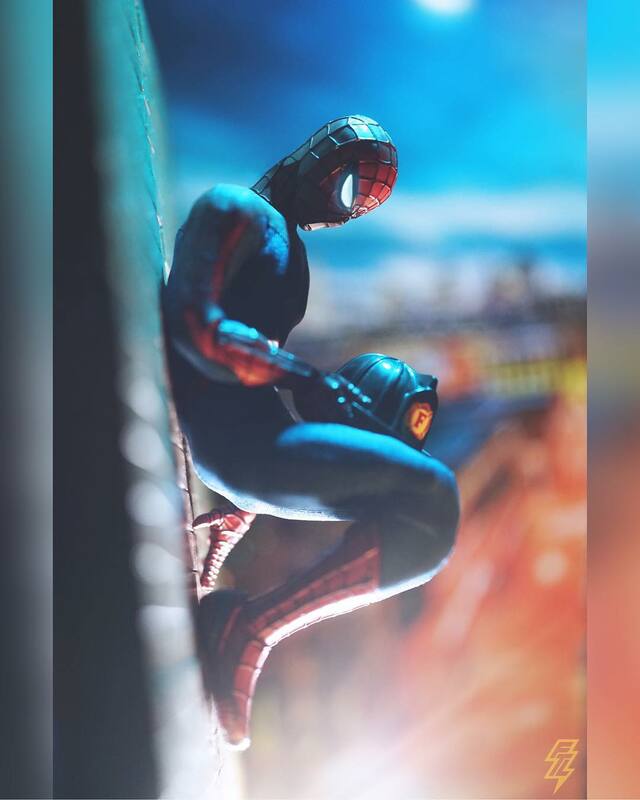 This entry was posted in Toy Chest Theater and tagged 9/11, action figure photography, action figures, fire department, firefighters, Instagram, Joe Hume, Marvel, New York City, NYFD, Rob Siebert, Spider-Man, Spider-Man toys, The Amazing Spider-Man #36 (2001), Toy Chest Theater, toys on 01/19/2019 by primaryignition. PENCILLER: Ben Torres. Cover by Jeff Dekal. 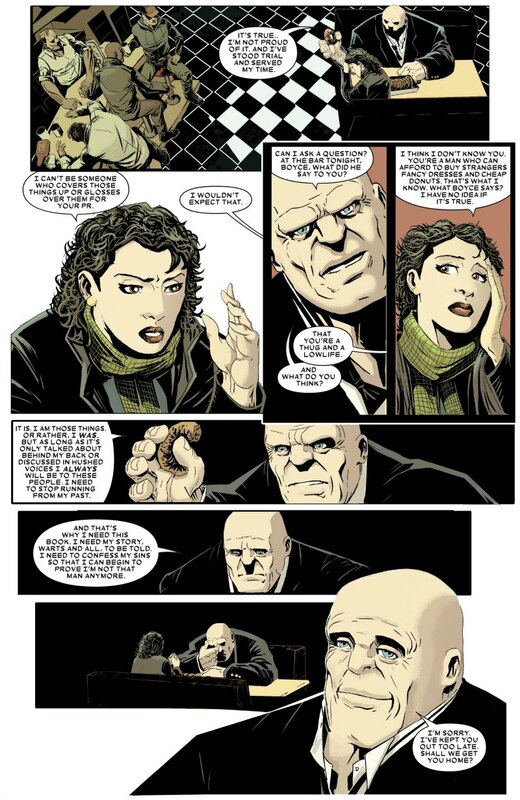 Considering Wilson Fisk used to be Marvel’s Kingpin of crime, he’s a pretty nice guy here. While you can use a lot of words to describe this character, “nice” has rarely been one of them. Take a moment and type “Kingpin, Marvel” into Google Image. What’s what thing he’s not doing in any of those pics? Smiling. The Kingpin doesn’t smile. At least not in a genuine, happy sort of way. But he does in Kingpin #1, and it catches you off guard. You’re expecting a grim and sadistic brute. Instead we get this warm and gentle teddy bear. Our “gateway” character is Sarah, who Fisk seems to have an interest in based on her writing. There’s a purity to that which is almost heartbreaking. He’s also unwaveringly kind, even if that kindness is rather awkward at times. It’s a stark contrast to this cynical, down-on-her-luck journalist who, despite the quality of her work, is struggling to keep her head above water. You end up hoping this warmth he’s showing to her is sincere, and not some sort of ploy. If your Google machine is still open, type in the name Wayne Dyer. He was a self-help author and motivational speaker who often appeared on PBS. At times, be Kingpin that Ben Torres gives us looks quite a bit like Dyer. Case in point, the bottom image on the page at right. Maybe that’s why he’s so happy. He read Change Your Thoughts, Change Your Life. Torres handles the pencils and inks for this issue. I’m not very familiar with his work. But he’s a tremendous fit for this part of the Marvel Universe. As he goes in heavy on the inks, you can see some Frank Miller on this pages, and a little bit of John Romita Jr. There’s even some Eduardo Risso. The mood is precisely what it should be: This is a place where hope is in short supply. We’re now finding hope in the most unlikely of individuals. And even that is likely smoke and mirrors. 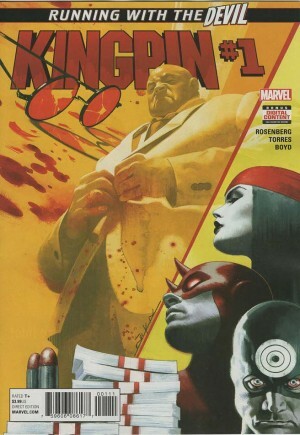 I can’t say I have a tremendous desire to come back for more Kingpin. Let’s be honest: We know how this story ends. The only real question is whether Sarah Dewey makes it out okay. But as for Fisk, it’s only a matter of time before the Kingpin is back on his throne. This entry was posted in Comic Books/Graphic Novels and tagged Ben Torres, Bullseye (Marvel), comic book reviews, comic books, Daredevil, Elektra, Jeff Dekal, Kingpin #1 (2017), Marvel, Marvel Comics, Matthew Rosenberg, New York City, Rob Siebert, single issue reviews, The Kingpin, Wayne Dyer, Wilson Fisk on 02/11/2017 by primaryignition. 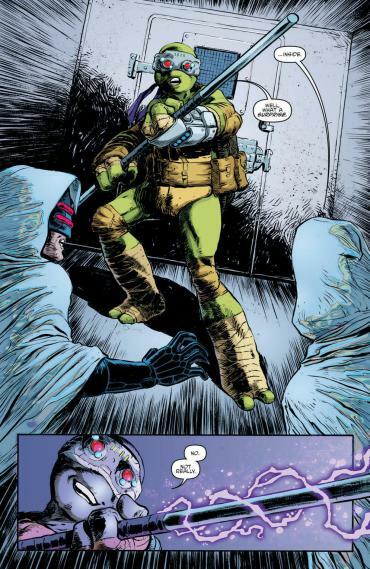 A Teenage Mutant Ninja Turtles #61 Review – This Meeting is Called to Order! Putting Splinter and the Turtles at the head of the Foot Clan opened a lot of interesting storytelling doors. But I never expected those doors to lead to a seven-page council meeting. But indeed, much of Teenage Mutant Ninja Turtles #61 consists of our heroes sitting at a table, plotting their next moves. To be fair, they have a lot on their plate. Kitten’s attack from issue #59 caught them off guard, and now both she and Alopex are missing. The Street Phantoms continue to plague the city, prompting the creation of new tech. All the while, Michelangelo continues to sever himself from his family’s involvement with the Foot, creating an uncomfortable and unprecedented divide. I used to be a beat reporter in the Chicagoland area. Part and parcel to that is covering board meetings. City council, park district, etc. I used to dread those meetings. They usually came on the heels of an eight-hour day, and they usually revolved around things that weren’t altogether very exciting. While I’d much rather see the Ninja Turtles conduct such a meeting, that seven-page scene was a little too reminiscent of my reporter days. One of the major strengths of this book is how rich and dense the world created for it is. 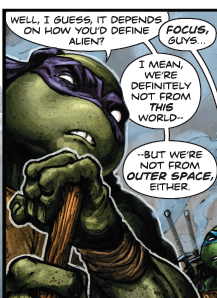 So much so that IDW is creating a separate series dedicated to TMNT‘s supporting characters. But if we’ve gotten to the point where we need to stop the story and spend multiple pages spelling out which characters are doing what, perhaps something’s wrong. The upside is that we get some nice character work revolving around this meeting. 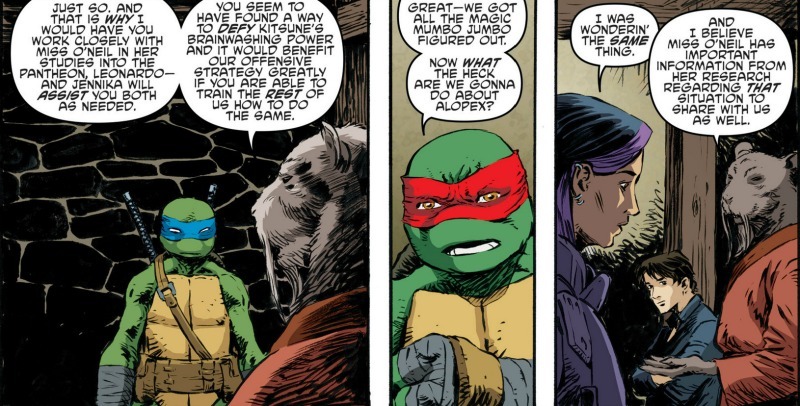 Mike once again refuses to be part of the Foot, calling Splinter out for being more concerned about Alopex’s ability to fight in a war than her health. We also see Leo show kindness to Jennika. I’m a bit perplexed as to why we needed yet another character in this book. But if our creative team has earned nothing else, it’s the benefit of the doubt. There’s also a really nice scene between Splinter and Casey Jones. It’s obviously important to establish Splinter is still the kind soul he’s always been, despite his new role. Casey asks if Splinter rejects killing the Shredder. He gives an answer about abhorring violence, but wanting to protect those he loves most. There’s an intriguing subtext here, considering Splinter may soon be in a position to kill many more as leader of the Foot. Dave Watcher has done fine on the pencil these last few issues. His style is sketchier than many of TMNT’s previous artists, which makes him a nice fit for street-level scenes, such as our opener with Donnie, Nobody, and the Street Phantoms. He also does some terrific cover work, especially next month’s with Casey Jones. Major credit must also be given to Ronda Pattison, who’s been the colorist on this book since day one. We’ve seen several artists give their take on the Turtles since they came to IDW. But Pattison has given this series a great consistency, and a nice familiarity when we open each new issue. I have a tendency to nitpick at the way certain artists draw the Turtles. That’s what being a fanboy for 25 years will do to you. Obviously there’s no textbook way to draw the boys in green. 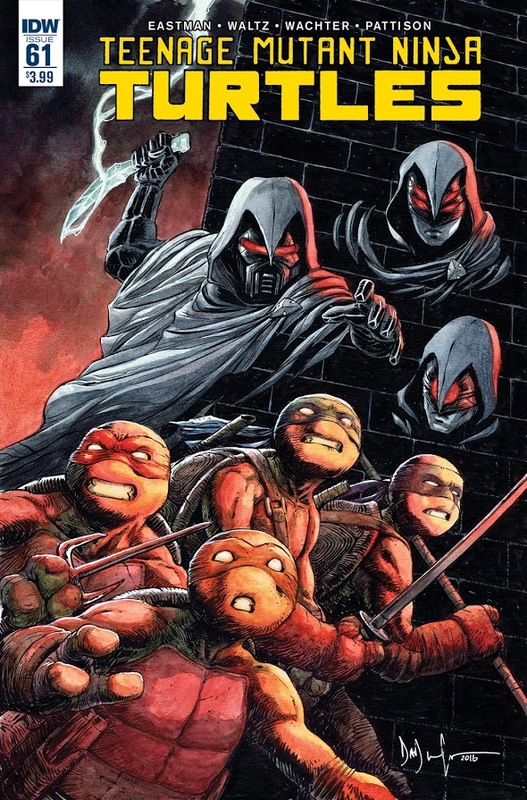 But both Watcher and TMNT great Mateus Santolouco draw their bandanas too big for my taste. It’s a little quirk to both artists styles, which are otherwise delightful. You could cut those suckers down a bit at each end and be perfectly fine. They tend to drape too far down over the “beak,” and go annoyingly high above the eye. I’m hopeful TMNT Universe will allow this title be a little less inflated. IDW has something really solid with the world they’ve created in this book. It begs to be explored, as they’ve done in numerous minis. A second ongoing should allow them to do it on a more consistent level, and take some of the pressure off the main series. This entry was posted in Comic Books/Graphic Novels and tagged Casey Jones, comic book reviews, comic books, Dave Watcher, Donatello (TMNT), IDW Publishing, Leonardo (TMNT), Master Splinter, Mateus Santolouco, Michelangelo (TMNT), New York City, Ninja Turtles, Raphael (TMNT), Rob Siebert, Ronda Pattison, single issue reviews, Teenage Mutant Ninja Turtles, Teenage Mutant Ninja Turtles #61 (2016), Teenage Mutant Ninja Turtles (IDW), The Shredder, TMNT, TMNT Universe (IDW) on 08/28/2016 by primaryignition. By God, it’s Batman and the Teenage Mutant Ninja Turtles! After all these years! It’s the team up we’ve always…kinda…sorta wanted…maybe? 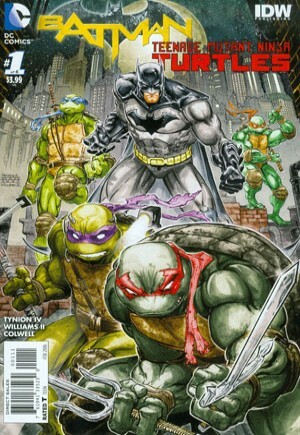 Indeed, DC and IDW are in the crossover business again, this time with The Dark Knight and the Heroes in a Half-shell. The Turtles, Splinter, The Foot Clan, and possibly April and Casey (that’s not quite clear) have somehow found themselves transported to Gotham City. The Foot have gotten their hands on several pieces of experimental tech, which suggests they’re building something big and dangerous. Naturally, Batman and the Ninja Turtles have a common enemy. But what sort of team will Batman and the TMNT make? This team up is different than, say, Teenage Mutant Ninja Turtles/Ghostbusters, in that it’s driven less by the characters and more by the setting. The Turtles have always been from New York City, and it’s fairly obvious that Gotham is modeled after the Big Apple. That’s what they have in common. That, I think, is where the thought of a Batman/Ninja Turtles crossover has always been rooted. Pencilling is Freddie E. Williams II, no stranger to Gotham, with a great run on Robin under his belt. That said, his take on Batman’s gear is a little too busy for my taste. 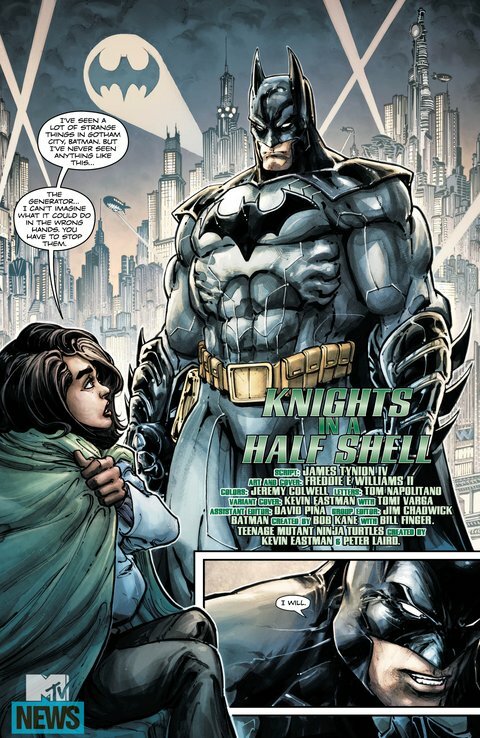 He gives him unnecessary shoulder pads, his take on the Grant Morrison/Frank Quitely Batmobile is gaudy, and on the title page (shown right) Batman’s head is a little too small for his body. It’s not his finest hour. That being said, his Ninja Turtles look on-point, as does his Shredder. I also like the texture he brings to his Killer Croc, if not the hunchback look. His layout for pages 3 and 4 is great, with a four large panels spread across the middle, each showing us one of the Turtles draped in shadow. This sequence, and all the others, are given an interesting light from Jeremy Folwell’s paints. Seeing James Tynion IV’s name on this book was encouraging. There’ve been times where I’ve enjoyed his work on Batman more than his cohort Scott Snyder’s. But again, oddly enough, the guy with a lot of experience on Batman falters with the Batman side of things. There’s a scene between Bruce and Alfred where our favorite brooding avenger of the night is a bit too chatty for my tastes. There’s a similar issue with Killer Croc, for that matter. The Turtles, on the other hand, come out mostly fine. Tynion takes time in the middle of the Turtles’ fight with Croc to play with the “Are the TMNT aliens?” issue from a few years ago. He manages to make this more charming than annoying, so it gets a pass from me. I don’t expect any sort of grand magnificence from Batman/Teenage Mutant Ninja Turtles. But there’s some mild intrigue here. How does Batman get along with the Turtles and Splinter? What happens when Batman fights The Shredder? Things like that, which are inevitably more fun in your head than they are on the page. But it will be interesting to see Tynion, Williams, and this team take a shot at it. This entry was posted in Comic Books/Graphic Novels and tagged Alfred Pennyworth, Batman, comic book reviews, comic books, DC Comics, Donatello (TMNT), Gotham City, IDW Publishing, Jeremy Colwell, Killer Croc, Leonardo (TMNT), Michelangelo (TMNT), New York City, Ninja Turtles, Raphael (TMNT), Rob Siebert, single issue reviews, Teenage Mutant Ninja Turtles, The Shredder, TMNT on 12/10/2015 by primaryignition. This book has the wrong title. Instead of No Escape, it should really be No Rules. At this point, with the Superior Spider-Man (who, remember, is Otto Octavius’ mind in Peter Parker’s body) totally free of influence from Peter Parker’s consciousness, he’s free to do things his way. And as we find out in this book, that means most traditional superhero rules are out the window. When we open No Escape, Alistair Smythe, a.k.a. the Spider-Slayer, and the man who killed Mayor J. Jonah Jameson’s wife, is scheduled to be executed at the Raft maximum security prison. Jameson brings in Spider-Man to ensure Smythe’s sentence is carried out. But of course, as Jameson himself says, “…madmen like Smythe always have some kind of escape plan.” And indeed, he does. It involves the Vulture, Scorpion, Boomerang, and a fight to the death. 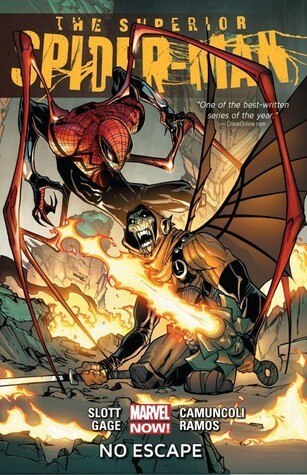 Later, Spidey takes the fight to both the Kingpin and the Hobgoblin in a manner most definitely not Spidey-like. In effect, it’s villain vs. villain. Obviously, Slott is using Otto to feed some of our innate desires to give supervillains what they really deserve. Superior Spidey is doing things to them that they’d have no problem doing to innocent people. Thus, a darker brand of justice is served. I suspect we’ll eventually get to see all of this come back to bite Spidey, however, whether it’s Peter Parker or Otto Octavius under the mask. This would, of course, illustrate that despite the short-term satisfaction gained from Otto’s methods, they’ve ultimately only created larger problems. No Escape had a tough act to follow. It’s predecessor, A Troubled Mind, gave us a truly epic confrontation between Peter Parker and Otto Octavius. This book doesn’t have anything like that. But make no mistake about it, the magic is still there. 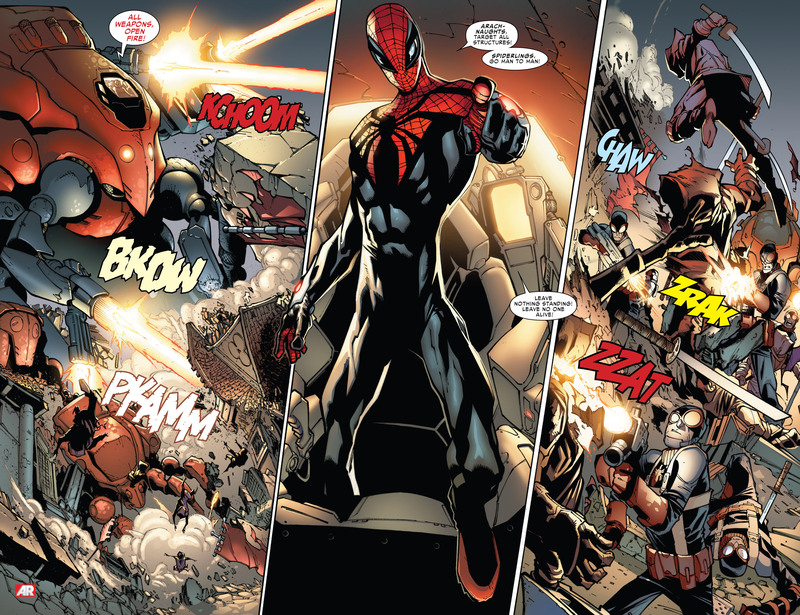 From a quality standpoint, The Superior Spider-Man is still one of Marvel’s top books. Call me a blasphemer if you must, but I feel no great need to give Peter Parker his body back any time soon. Image 1 from twilitdreams.wordpress.com. Image 2 from followingthenerd.com. This entry was posted in Comic Books/Graphic Novels and tagged Alistair Smythe, Anna Maria Marconi, Christos Gage, Dan Slott, Doctor Octopus, Giuseppe Camuncoli, Hobgoblin (Marvel), Humberto Ramos, J. Jonah Jameson, Marvel, New York City, Otto Octavius, Peter Parker, Phil Urich, Spider-Man, Spider-Slayer, The Superior Spider-Man, The Superior Spider-Man Vol. 3: No Escape on 11/20/2013 by primaryignition.